Centropa is a Jewish historical institute based in Vienna, Budapest, Hamburg, and Washington DC, and you can read about how we preserved Jewish memory in Central and Eastern Europe at this link. We conducted 70 interviews in Romania and digitized 1,600 old family pictures—and every one of them is annotated by those we interviewed. By fall 2016, forty-five of those interviews and nine hundred pictures had been uploaded to our site and more are uploaded each month. Click here to explore our Romanian database of Jewish memory. When the 20th century began, there were untold thousands of synagogues that dotted the landscape between Riga and Tallinn on the Baltic Sea and Thessaloniki on the Aegean. The coming of Communism to the Soviet Union in 1917 meant the end of religious life in Russia, Belarus, and Ukraine, where synagogues were shuttered, their interiors often stripped, and the buildings adapted for other use. Then came the Second World War and the Holocaust, which destroyed countless more synagogues—and millions of those who worshipped in them—throughout the entire region. In the years immediately following the end of the Second World War, most of the countries in East Central Europe became satellite states of the Soviet Union, and that meant a large percentage of surviving synagogues in the three Baltic states, Poland, Czechoslovakia, Hungary, Romania, and Bulgaria fell into ruin or were adapted to other use—furniture warehouses, libraries, fire stations, even swimming pools. The synagogues of non-aligned Yugoslavia suffered the same fate. There were very few Jews left alive in any of these countries (save Hungary) to care for them, and their resources were meagre. Since the fall of Communism in 1989 in Central Europe and the collapse of the Soviet Union in 1991, hundreds of synagogues have been returned to Jewish communities and renovated—some sensitively, others less so. Save for Albania, Montenegro, Macedonia and Kosovo, there is not a country in the region today that does not boast restored synagogues. What makes Romania the outlier in this narrative is that a great many of its synagogues were fully maintained as synagogues all during the Communist decades. That is due to the efforts of one man, Chief Rabbi David Moses Rosen (1912-1994). Trained as a lawyer and ordained as a rabbi, Rosen led the Jewish community through two hardline Communist regimes and eventually outlasted them both. He saw to it that as many synagogues as possible were maintained, that children could study Hebrew and celebrate Jewish holidays. Under Rosen’s tutelage, over 300,000 Romanian Jews emigrated to Israel and thanks to The Conference on Jewish Material Claims Against Germany and the American Jewish Joint Distribution Committee, Rosen maintained a highly effective social welfare program for thousands of Holocaust survivors. In the years after Rosen’s death in 1994, synagogues throughout the country have been renovated, but for the most part, to a lesser degree than synagogues in neighboring countries, simply because they didn’t need it. Some however, such as in Constanta, have fallen into total ruin and synagogues throughout the country have been turned into vegetable warehouses, bakeries, and storehouses. Others have simply, and sadly, collapsed. 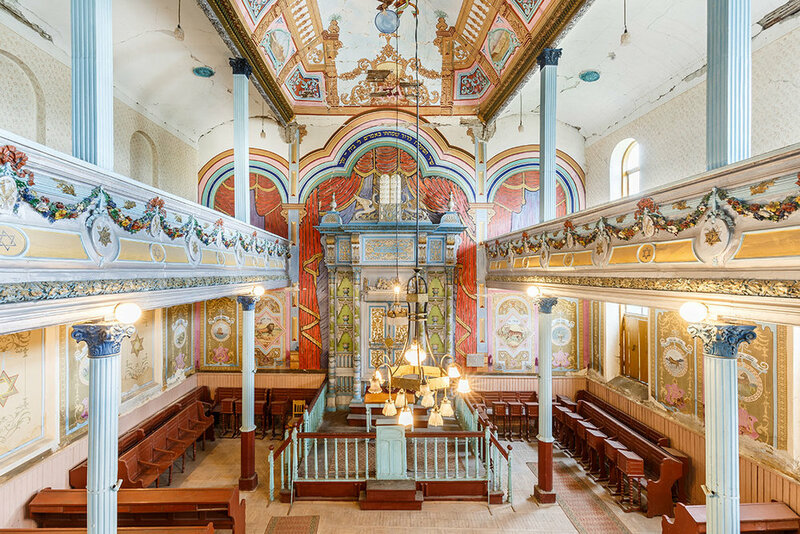 The fourteen synagogues Daniel Gruenfeld documented for us are all located in the verdant hills of northeastern Romania, specifically in the Bukovina and Moldovan regions. Some of these small towns had once been shtetls, with more Jews than non-Jews living in them before the Second World War (Radauti is but one example). Daniel devoted at least a half day to each synagogue, bringing along heavy duty electrical cables, portable lights, flash heads, reflectors and illuminated soft boxes to illuminate their interiors. Ably assisted by Oliver Beck, Daniel and Oliver accomplished their assignment in the spring of 2016. Special thanks goes to our partner, Dr Felicia Waldman of The Center for Hebrew Studies and the Goldstein Goren Center for Israel Studies at the University of Bucharest, as well as our researcher, Anca Tudorancea of the Center for the Study of the History of Romanian Jews. There are some synagogues Daniel did not yet photograph—the great synagogue of Iasi was under restoration; he could not gain access to Harlau—and there are dozens of other synagogues in other parts of Romania that are also very much worth documenting. In this collection, Daniel gives us a thorough record of those synagogues filled with murals and wooden carvings, that have—to our knowledge—never been professionally photographed. We deeply appreciate the financial support from the David Berg Foundation, which made this project possible. We wish much success to the art historians and other academics at Tel Aviv University and the Center for Jewish Art at Hebrew University, who are free to use Daniel’s fine documentary photography in any way they wish. We hope you will browse through these pictures of synagogues that take us back to a world now lost, and contact us should you have any questions or comments.